"A 100% faithful remake of the original game, it therefore suffers from the same poor storyline and unexpected deaths, but it does feature original artwork and soundtrack." The puzzle with the condor was very annoying. Check the walkthrough on YouTube if you're stuck. Its definitely a good game, with some good puzzles spread throughout, complimented by good visuals. But it kind of put me off how there were a bunch of puzzles that were just random or not necessary to the game... but the puzzles that progressed you throughout the game are very good. Keep playing if you don't like it at first.. it starts to grow on you. this game was amazing for a remake, keeping all the same puzzels diologue and screens as sierras KQ Remake of thier own. only 1 small glitch where moving wouldnt work, and some stopping at the edge of the screen, nothing bothersome. This is the game that got me hooked to point and click adventures. All the games in the series are great! I preferred KQ3 to this game. There are the same beautiful backgrounds and exceptional animations but sometimes I found myself just wandering around wondering what I should be doing next. Maybe that's more of a comment on me than the game, though. It's a shame it hadn't been tested for the larger screen size (the smaller one was just too tiny for me) as it crashed quite a lot (usually on the "restart/restore/quit" dialog when I'd just died). The route to the creature that has the chest (no spoilers here), once you have created it, is only visible after you stop walking into the room that contains it, rather than as soon as the game switches to that room. But it's a very good game, in spite of the flaws. The work that has gone into the backgrounds, animations and extended cutscenes is truly amazing. I like the idea of having to use brain over brawn. You can, if you choose, flail your way to the end of the game, killing everything in sight, but you'll get a much higher final score if you use more cunning means to achieve your aims. Great remake of a classic. Of course, being a faithful remake it has some of the flaws of the original such as the lack of much of a story and it is a bit corny. After all, it is, basically, a game of fairy tale references. But, like the original, it is a much better game than it seems it should be. The player character, Sir Graham, explores a very small world (you go far enough west you end up east and vice versa, same for north and south) searching for three lost treasures of the kingdom. Simple exploration. But, like the originals (Sierra made one remake) the game is much more. It has interesting locations and interesting characters for Sir Graham (who is, himself, not really that interesting) to meet. 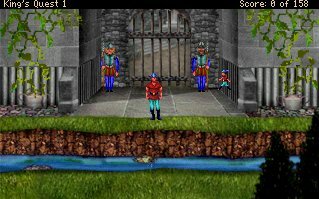 It has been awhile since I played the Sierra original and remake so I'm relying on my rather faulty memory but this remake seems to be very faithful to the originals in story and gameplay. It has the corrected puzzles of the original remake. I don't know if it has made any changes to any of the gameplay but there is at least one easter egg that I don't believe is in the originals. The graphics are much better than the originals, of course. Sir Graham's world is very pretty in this game. Also this game has speech unlike the original. I found the voice acting to be good. This is the King's Quest I, in all it's colorful glory, of my memory. I'm sure I would find the true originals to be rather frumpy in comparison. Especially after playing this VGA version. If you are a King's Quest fan, play it. If you are not, I recommend you try it anyway. Great game. The best graphics of the 3 king's quest shown here, has nice ideas and a decent storyline. Only one thing: there isnt a treasure sequence, first this and then this one, you choose randomly, so the storyline value decreases a bit. Great prequel to the best game ever. this game is really fun. although it seemed a little boring at the start, as the game progressed it just got better and better through the end. The game has at least one obvious script bug that really detracts from the whole. I don't think it's quite worthy of the awards it received. KQ1 has been a nice game for a long time, but this is the first time I could play it with quality pictures and sounds. They add a lot to the immersiveness of the game, I must say. It's a good effort by Tierra in remaking this classic! Nice, nice! A few annoying places, like the beanstalk, but very true to the original. I'd love to see KQIII remade. I haven't played this game so much yet. But the little i've seen is amazing. It feels exactly the same as I played it on the Amiga many years ago. But this time it has greater graphics. Anybody who haven't played Kings Quest I should download this game right now. And for those who have played the game, download this if you, once more, want to get back to the kingdom of Daventry.